Discussion in 'SRD Sprint Cup Offline League' started by Zoom, Feb 14, 2019. Last Race: Noah Joyce dominated in Iowa, leading 75 of the 125 laps. 5 more drivers were eliminated from the championship chase including Joey Isaacs, Billy Nixon, Will Anderson, Kyle Missimer, and Shane Lennox. This Race: 1 more race left to decide the 2018* champion. 5 drivers remain in the hunt for the title. DJ Harris enters the final race as the #1 seed, having the best average finish through 19 races of the remaining 5 championship drivers. Harris was in the championship 5 last year but was not able to secure the title. He'll look to change that this weekend. 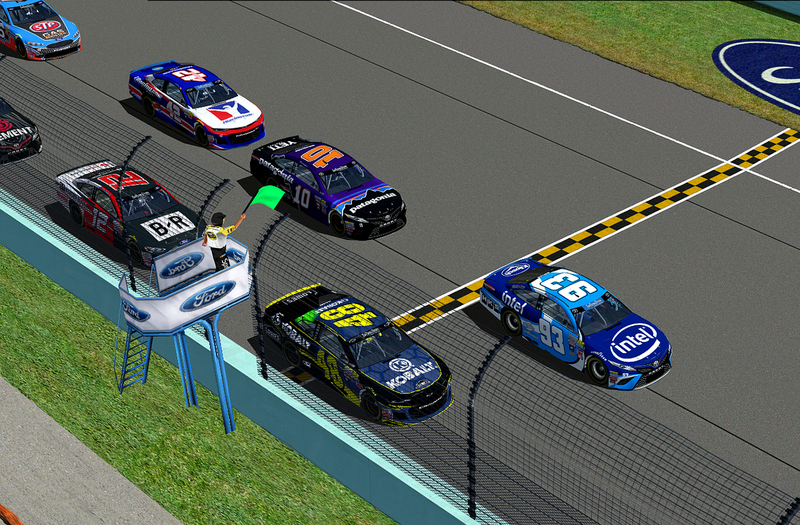 Darren Ingram enters the finale at Homestead with a chance at the title for the 3rd straight year. Ingram, the only chaser to have a better starting average than finishing average, will need to break that trend if he wants to become the 2018 champion. Tyler Mallon put the SRD Cup scene on notice in 2018. Picking up 2 wins and a season high 9 Top 10's (T-1st) through the 19 races run. The rookie has shown he has the speed, but will he crack under pressure with limited experience. John Hooper, Sr enters the race weekend as the only past champion. Hooper a former winner hear at Homestead, might have to repeat his 2016 performance if he is to add to his championship collection in the final race of his career. The veteran looking to go out on the highest note possible. Steven Merzlak is our other rookie that will have a shot at picking up the championship. Merzlak has shown speed but also a few mistakes having the most DNF's of the 5 drivers, failing to finish 21% of the races run this year. Much like Mallon, Merzlak will have to stay cool under the pressure of racing for a championship. 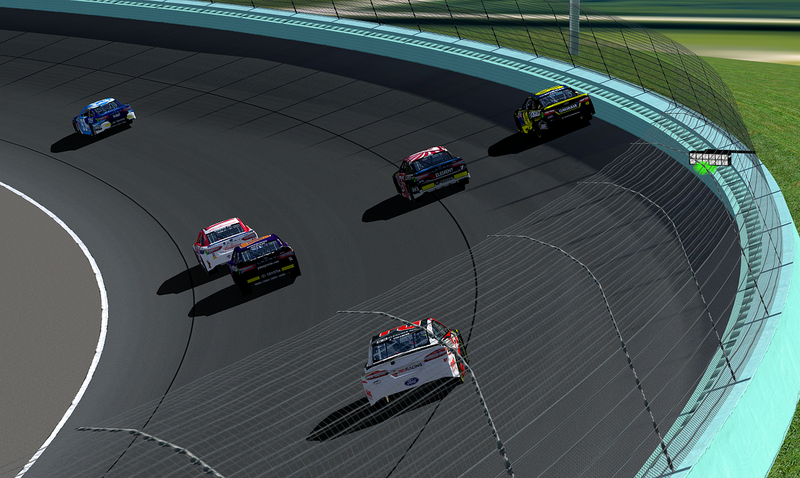 Mallon strikes first, puts pressure on the other championship five after taking the pole for the finale at Homestead. NascarMan32, BrendonH12, Reza Maulana and 2 others like this. "Starting P9, not as high as we wanted, but we feel really good about our car in race trim. Just gonna stay out of trouble and get to the front, and control the pace of the race." "Mid pack not what we wanted. We should have a good car for the race just have to be sure to avoid trouble early." "21st might be a lucky starting position, who knows?" Well, I apex'ed the center of the corner wrong on 3 and 4 on the final lap, and it showed in out time. I've put us behind the 8=ball a lot this season with my qualifying, but we'll be there for race day. I love Homestead, I just hope is shows some love back for me. If we can we'll try and get Matt and Joshua up there with us running there all day long. "Tyler has a tenth and a half on us so far, but I know this #42 team will get me to where I need to be in order to win this trophy. #1 seed and a fast car - I can just picture standing up there with that cheque." "Holy crap we're gonna clinch the team title. We completely missed the setup in qualifying trim but have a good feeling we can get this Hoonigan camaro up to the front and close out this season on a high note." Race coming up in about an hour. @darreningram - "Ready to fight with my guys and get the #SRDCup title." Engines have fired here in Miami as we prepare for the final race of the season. 5 drivers looking to take home a championship tonight. Mallon and Llamas lead us to the green flag! We are underway! Lap 1: Mallon breaks away on the start and clears himself into turn 1. Wichelman and Llamas battle for 2nd as the field fans out 2 and 3 wide all the way back. Lap 2: Llamas works the outside line in turns 1 and 2 and clears Wichelman for 2nd. Harris working over Coleman for 4th with a 3 wide battle between championship contenders just behind. Ingram stuffs it to the inside into turn 3 looking to make up positions early. Merzlak forced to the middle with Hooper railing the outside. They remain 3 wide off of 4 and down the frontstretch. Lap 3: Ingram gets a little loose in turns 1 and 2 and drops out of that 3 wide battle but Merzlak and Hooper carry momentum off turn 2 and now put Harris into the 3 wide battle into turn 3. Harris backs out as both Merzlak and Hooper go by. Merzlak clears Hooper to take 5th. Mallon out in front with his competitors racing hard early on. Lap 4: Anywhere on this track is fast right now as we look mid pack and see cars from top to bottom. Lap 5: Merzlak has worked around Coleman and Wichelman to move up to 3rd. 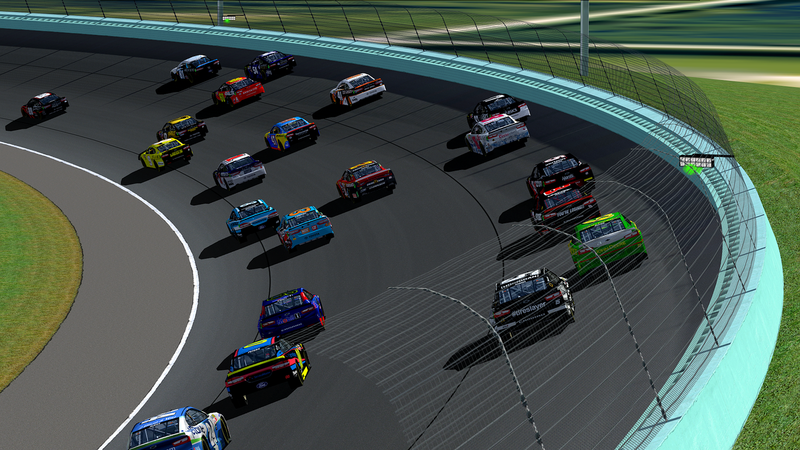 The two rookie title contenders so far leading the way as Mallon continues to lead by 1 car length over the defending Miami winner Cody Llamas. Hooper is up to 5th with Harris down to 8th and Ingram in 9th. Lap 9: Front runners finally starting to spread out and get single file. Mallon still leads by about 1 car length over Llamas. Merzlak still P3 with Hooper just behind in P4. Wichelman, Coleman, and Webster run 5th through 7th. Harris and Ingram still stuck in 8th and 9th early but still a lot of race left to run. Caudill rounds out the top 10. 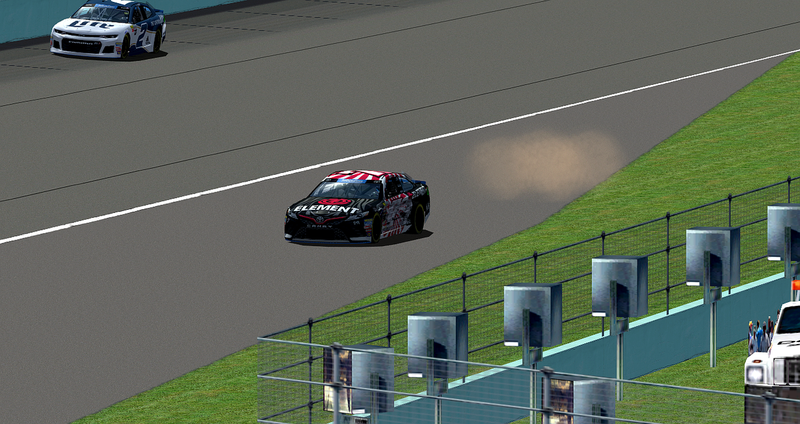 Lap 12: Merzlak goes for a move for 2nd into turn 1 and Hooper echoes that with a move to make it 3 wide for 2nd. Llamas way to the top nearly scrubbing the wall in turns 1 and 2. TROUBLE FOR MERZLAK! Off turn 2 Merzlak pushed on exit and just clipped Llamas in the left rear. Merzlak gets crossed up and runs off track and hits the inside wall. Merzlak keeps it straight and tries to rejoin on the track into turn 3 but carries too much speed and slides up the banking and collects DJ Harris. Ingram uses up every ounce of luck he has as the seas part and he splits both cars and makes it through clean. We stay green as Merzlak and Harris get back up to speed but both drivers have damage, Merzlak with heavy damage to both sides of his Camry. We take a look at the onboard from Ingram during that incident. That could've easily ended all 3 drivers chances early in this race. "Woahhhh, saw that in my mirror. They didn't hit John, did they?" 7 - "Can't say I'm surprised. Fucker has never been able to drive."